cresses a handful of Brooklilme both a little bruised. Slice in two or three oranges outsides and insides let them boil all together better then half anhour then put in a good quantity of scurvy grass burised and put into ye liquor set it over ye fire again then there will arise a curd which being taken of put it into ye drink when it is cold three or four limons. 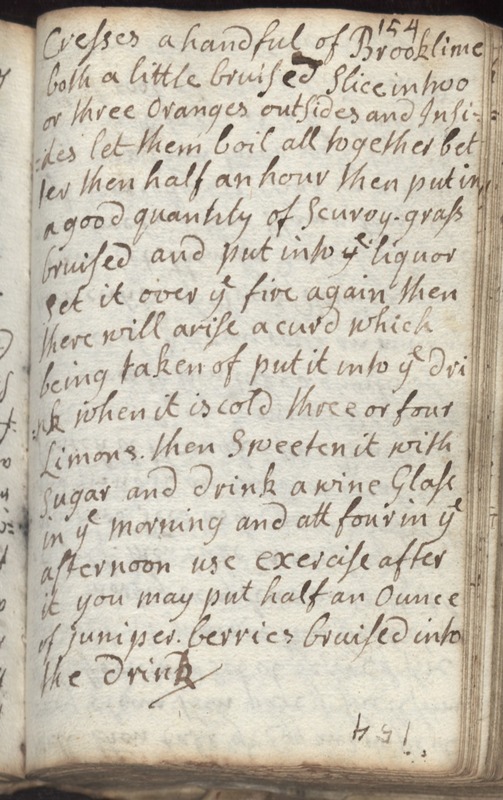 Then sweeten it with sugar and drink a wine glass in ye morning and att four in ye afternoon use exercise after it yu may put half an ounce of juniper berries burised into the drink.